Why do international, Yemeni officials describe the coalition in southern Yemen as occupation? Many international and Yemeni official keep asking the Saudi-led coalition, backed by the US, especially UAE to stop its practices, which violates the international law in southern Yemen . Interior Minister Ahmed al-Misari of exiled, resigned president Abd-Rabbu Mansour Hadi and Ben Daghr’s authorities backed by Saudi Arabia said there are a number of indicators that confirm that the UAE came to occupy South Yemen. Al-Misari’ remarks came within an interview aired by the US-based PBS TV. Press secretary of the exiled Hadi called for filing a lawsuit against the UAE military commanders, who run secret jails in Yemen’s southern provinces through paid fighters loyal to them. Mukhtar al-Rahbi tweeted on Twitter saying” A lawsuit should be filed against Shalal Shaya and all militia leaders supervising the jails in the city of Aden and also against the UAE military commanders who run secret prisons in the city, calling on the human rights organization to document all violations and those responsible for them, and to publish all the details and submit them to the judiciary at home and abroad. Former South President Ali Nasser Mohamed said the removal of the exiled President Abed Rabbo Mansour Hadi from the Yemeni political scene will end the war in the country. “The only solution to stop the four-year war is to remove the exiled president from the Yemeni scene,” Ali Nasser Mohamed said during a meeting with southern activists in Cairo, Egypt. He added that Hadi’s dismissal is the solution that will end the war. The UAE forces established secret prisons in the provinces controlled by its forces southern Yemen to hold its opponents and who reject the external military presence. The UAE forces in southern Yemen established five graveyards near secret detention centers to hide and bury bodies of prisoners died during investigations, officials told YemenExtra . The officials revealed that the UAE forces had committed genocide crimes against detainees and prisoners in Aden and Hadramout provinces. The exiled Hadi regime Minister of Transport arrived at Ghadah airport in the occupied province of al-Mahrah, aboard a Turkish commercial plane, whereas observers said that the arrival of the Minister of Transport through a Turkish plane to Mahrah province is a sign of a strong Turkish competition for the UAE and Saudi occupation in the southern provinces. They stressed that Islah Party has begun to penetrate in the southern provinces through the Turkish Red Crescent and Turkish humanitarian organizations, which began to compete strongly with the UAE-based Red Crescent in the city of Aden. According to the officials, two graveyards are located near the old Bir-Ahmed prison, one of them is between Aden Airport and the Emirati Red Crescent headquarters, and another one inside Waddah prison in Aden city, in addition to two cemeteries, one next to the so-called Hadrami elite forces’ camp and the other within Al-Rayyan Airport campus in Hadramout,adding that murdering of prisoners and detainees is carried out by an Emirati officer named Abu Khalifa Saeed al-Muhairi, who is in charge of the detainees file. The United Arab Emirates (UAE) attaché in Cairo directed to expel about 20 wounded people from the southern provinces who are receiving treatment in some hospitals in Cairo before completing their treatment period, according to diplomatic sources. The sources said that the Egyptian medical Committee received instructions from the Emirati attaché at the UAE Embassy in “Cairo” to expel more than 20 wounded people from the southern provinces who were receiving treatment in Egyptian hospitals, before the completion of their treatment and return to the city of Aden. 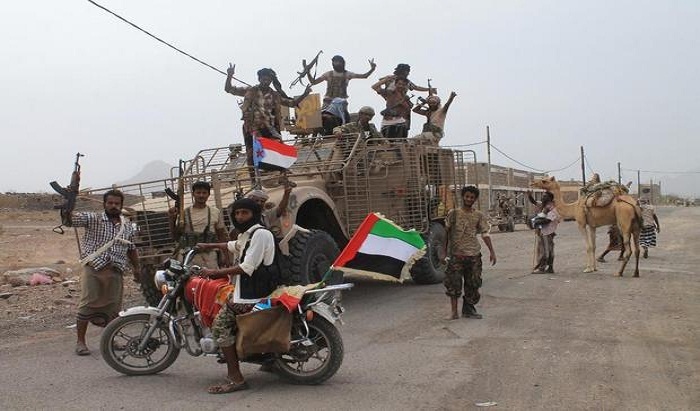 A report published by” The Guardian” newspaper confirmed that the United Arab Emirates (UAE) is responsible for security chaos and civil disorder in the areas by its hired troops in southern Yemen. Abu Dhabi is implementing its special agendas, and the war in Yemen has been transformed into wars and internal civil war due to the UAE’s intervention, the report said. The report added that the Saudi-led coalition is witnessing competition among its members, with each party trying to achieve its different agenda. It stressed that Emiratis are the only party with a clear strategy, and they are using private armies to achieve those strategies. A British channel (CHANNEL4) showed a video revealed flagrant violations and torture against Yemen’s southern detainees in secret prisons established by the United Arab Emirates (UAE) forces in Yemen’s southern provinces. The channel published on December 6 a report showing a Yemeni citizens who were severely tortured and spent two years in three different prisons. A recent report revealed the US’s active complicity in the deadly Saudi-led war on Yemen, saying the Pentagon runs an aerial combat training program for UAE personnel. What do the Yemeni army forces do against the coalition?